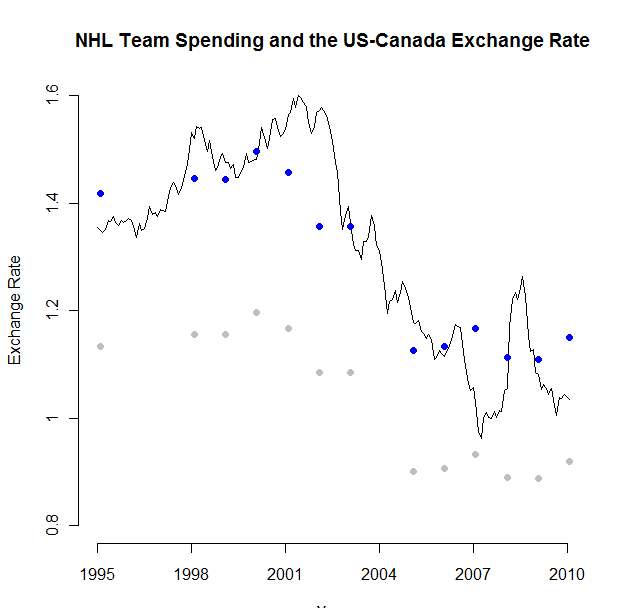 Based on an idea that was discussed at last week’s HSAC meeting, I decided to do a short investigation to see how the exchange rate of the US dollar versus the Canadian dollar impacts team spending in the NHL. The idea is that as the US dollar has fallen over the years, the Canadian teams should have be able to start outspending their American counterparts. The graph below shows the exchange rate of the dollar (plotted in the line) as well as the ratio of US dollars spent by American teams to US dollars spent by Canadian teams (grey dots). The blue dots are simply a normalized scaling of the gray dots. The grey dots show the ratio between US team spending and Canadian team spending. For example, the first gray dot is located at 1.1345 which means that in 1995 US teams had team payrolls on average 1.1345 times larger than Canadian teams. 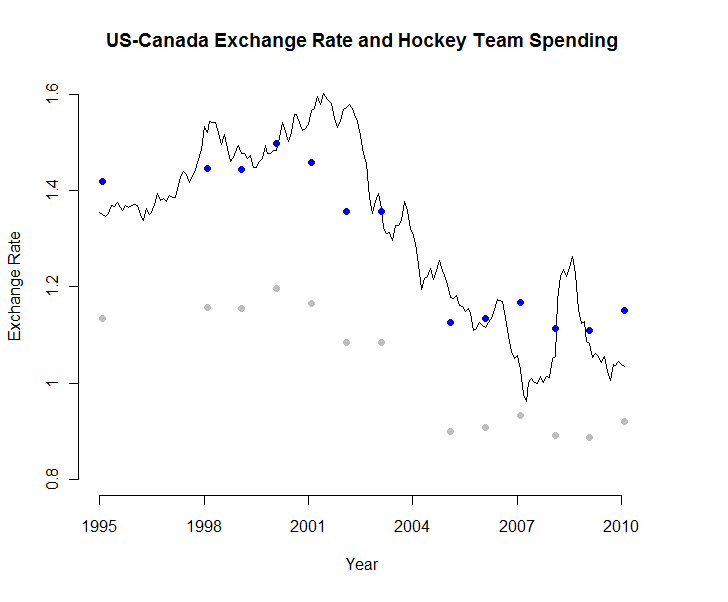 Although the currency exchange rate has averaged a ratio of 1.31:1 over this fifteen year period, the ratio of US team spending to Canadian team spending has been only 1.05:1. This suggests that an increase in the exchange rate, let’s say 10%, would not alter the ratio of the salaries by the same 10%. The ratio of the previously two calculated terms, 1.31/1.05, was used to multiply the original team spending ratios (grey dots) to produce the new ratios (in blue dots). This scaling makes the comparison between team spending ratios and exchange rate easy to recognize in the plot. This post is not meant to a rigorous examination of the role of exchange rates in sports, but the graph above clearly suggests that teams spending is affected by it. It should be noted that the CBA signed after the 2004-2005 NHL lockout has changed the way teams can spend money. There is now a lower limit and an upper limit that teams can spend on money. This would bring the ratio closer to one as the ratio of spending between any two teams, regardless of country, is restricted. Although the values on the graph do get closer to one after the CBA, it is tough to tell if this is due to the CBA or (sadly for us Americans) to the exchange rate hovering around one dollar.